A guide to hiking shorts for men and women thru-hiking in 2019. Summer hiking means swapping out those pants you wore during the spring and fall and replacing them with a pair of shorts. Pants are necessary for cooler temps and walking through thick brush, but a good pair of shorts are essential when the outside temperatures start to climb. 1. VENTILATION: Unlike pants that hold in heat, shorts provide ventilation allowing you to shed the excess heat you generate when pushing yourself up a mountain. Most would agree that the last thing you want on a summer hike is to overheat. It'll slow you down, make you nauseous and if you let it go too far, it could turn into heat stroke which could kill you. 2. COMFORT: Shorts also provide a wider range of motion than pants. When rock scrambling, pants limit how far you can stretch your legs, making it difficult to move across rock faces and over boulders. Shorts are more comfortable allowing you to move your legs as far as your body will allow without the fabric holding you back. 3. VERSATILITY: When you are hiking in variable conditions, shorts can be part of a simple layering system. You can throw on a pair of shorts of thigh-length hiking shorts and pull up your socks to cover your legs if it is chilly in the morning when you hit the trail. As the temps warm up, you can roll down the socks so your legs can breathe again. 4. WEIGHT: High-quality hiking shorts weighing around 10-ounces or less, they are a no-brainer for your ultralight backpacking wardrobe. A NOTE ON SHORTS AND RAIN: You may thing pants are preferable when it rains, but that's not the case in the warm showers of the summer. When it rains, you'll be happy that you are not wearing pants which can become soggy and heavy as they take on water. Shorts tend to stay drier because a poncho or a rain jacket usually covers most of your shorts offering some protection from the elements. If they do get wet, shorts tend to dry more quickly than pants simply because there is less fabric. There are two main types of hiking shorts you should look for when you are shopping-- lightweight running shorts or minimal hiking shorts. There are no right or wrong choices when it comes to choosing between these two types of shorts. 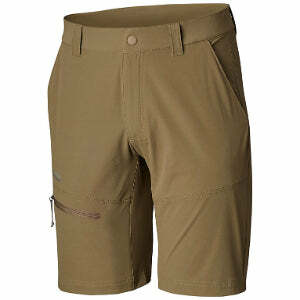 You should purchase the shorts that best suit your style of hiking and what is most comfortable for you to wear. Lightweight running shorts are no longer relegated to the track or athletic field. Hikers and trail runners have uncovered the advantages of this short. Because they are designed for speed, running shorts are lightweight. They tend to be made from a thin material that is light and often quick drying - a double bonus for hikers. Some running shorts include a mesh inner liner (no undies required!) to aid in airflow while others have a built-in compression short. For those who tend to chafe, a compression liner is a major plus. Running shorts have a broader market appeal, so they are easier to find in stores and are usually cheaper to buy than standard hiking shorts which are more of a niche item. They typically have shorter inseams and lack extras like pockets and belt loops. Running shorts are best for fastpacking and hiking in hot days when you want the lightest and least restrictive material possible. They can be very comfortable as long as you don't mind the short-shorts feel. Minimal hiking shorts take the lightweight, quick-drying fabric of the running short but are designed with hiking in mind. They tend to have a longer inseam (mid-thigh to above-the-knee) and usually have a few pockets to stash lightweight items like your wallet when you are in town. Many hiking shorts have some stretch so they will flex and bend with you as you traverse challenging terrain. Material and craftsmanship also lean towards the strong side so they can stand up to abuse from rocks and roots without ripping at the seams. 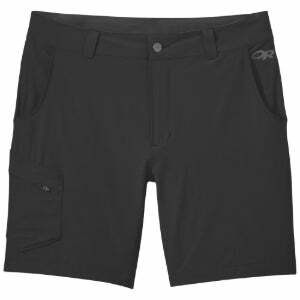 Minimal hiking shorts are best for hiking in rough terrain when rocks and brush threaten to snag your shorts and rip them to shreds. Because they cover more of your leg, hiking shorts also work well in colder temperatures when breathability is not as important. Nearly all men are comfortable in minimal shorts because they are not short-shorts like running shorts and they stretch when you move. 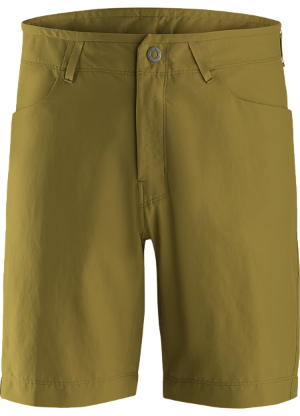 When choosing these more traditional hiking shorts, try not to be lured in by cargo shorts which look like minimal hiking shorts but have a ton of pockets. Though these pockets appear useful, you will hardly ever use them on the trail, and they quickly become unnecessary extra weight. Bermuda shorts are another style of hiking short you may encounter. Bermuda shorts are usually made with a cotton material that doesn't stretch and have a long inseam that falls just above the knee. They typically are designed for semi-casual wear, but some hiking companies are making Bermuda style shorts out of hiking-friendly material that is breathable and quick drying There is nothing wrong with Bermuda shorts as long as you stick to the hiking models and stay away from the dressier ones. In your quest for the perfect pair of shorts, you may stumble across the convertible pant, a pair of full-length pants with zippered legs that are removable. They are called "convertible" because you can unzip the leg and remove it to convert the pants into shorts. This style of pant is useful when you are hiking in conditions that require you to switch frequently between pants and shorts. You can slide off the pant leg when you heat up in the protection of the woods and then slip it back on when you get hit by the cold wind on a ridge. Convertible pants are available in lightweight materials suitable for warm weather hiking and heavier materials for the shoulder seasons. Though convenient, you have to be careful with this style of pant as it is easy to lose one of the legs after you remove them. Once a leg is missing, you lost the ability to wear the garment like a pair of pants. Choosing a pair of new hiking shorts is not as easy as it sounds. Not only do you have to find the style that fits your type of hiking and is comfortable to wear, but you also have to consider the fabric, the kind of closure you want, the extra features you need, and more. We break down the major features you find in a pair of regular hiking shorts to help you in the decision making process. Go to a clothing store and check out the shorts rack and you will see a wide variety of materials. Nylon: Nylon is an excellent fabric for hiking. This synthetic fabric is soft on the skin, lightweight, breathable and it dries quickly. Unlike cotton which soaks up your sweat, nylon wicks sweat away from your skin and moves it to the fabric surface where it can evaporate. This wicking process is effective, but it can't keep up when you are sweating heavily from exertion. Nylon will get wet with sweat because it can absorb small amounts of water, but when you slow down to take a break, this evaporation helps the fabric dry quickly. Nylon also is oleophobic so it won't absorb stinky body oils produced from the exertion of climbing mountains. WIth nylon, you'll stay drier as you hike and you won't stink as much either. Polyester: Polyester is another common synthetic fabric used in hiking gear and clothing. It is lightweight and breathable like nylon, but it is hydrophobic and repels water. Polyester won't get soaking wet with sweat and will keep you drier than nylon when it rains. Polyester is also more resistant to UV damage which is why it often is found on clothing and outerwear. The drawback of polyester is that it’s not as abrasion resistant as nylon. It also absorbs oils, so it tends to absorb that hiker stick and holds onto it even after you wash it. Spandex: Spandex is the wonder fabric that gives all your clothing it's stretch. It can stretch up to 6 times its original size and then shrinks right back down to size. Linke nylon and polyester, spandex is breathable, moisture-wicking and quick drying. Spandex often is used along with nylon and polyester to give shorts a little bit of stretch. Cotton: Cotton Kills is a common mantra in the hiking community and for a good reason. Cotton is highly absorbent and holds onto the water it soaks up. If you fall into a creek on a blustery fall day and are wearing cotton, you could find yourself battling hypothermia. On a warm day, cotton isn't the devil fabric it is made out to be. The ability of cotton to hold onto water gives the fabric a cooling effect which might be beneficial on a hot day. Cotton absorbs water and holds onto stains, but it doesn't' hold onto the hiker stink as bad as polyester. Fabrics to avoid: Though they may look good or are durable, khaki, jean or canvas shorts are not suitable for hiking. These materials don't breathe and won't dry quickly if they get wet. Some hiking shorts include DWR (Durable water repellent ) and UPF Ultraviolet Protection Factor), both of which provide an extra layer of protection from the elements. The most common additions are DWR which is a coating added to fabrics during manufacturing that gives them water resistance. Shorts with a DWR treatment will stay drier for a longer period. UPF, on the other hand, is a rating given to clothes that have been designed to protect you from the harmful rays of the sun. Garments with a higher UPF rating provide better protection from the sun. Do you like your clothes baggy or slim fitting? Does it matter what type of style you choose for hiking? Absolutely not. Baggy or slim -- it's all up to you. We only suggest you clothes are not so loose that they are falling off. You wouldn't want to snag your shorts on a branch and moon everyone on the trail. One feature you should consider when fitting shorts is the rise. Try to avoid a low rise short. Slim or baggie, a low rise short will fall right where pack waistband sits. This could be uncomfortable and lead to chafing. Look for a moderate or even a high-rise short for comfort. People love pockets, but they are not very useful in a hiking short. When you are ascending or descending a mountain, the last thing you want is a lump or bulge in your pocket getting in the way of hiking. Pockets can be useful to warm up your hands when it is chilly or to store your wallet when you go into town, but you can find other ways of accomplishing those tasks. 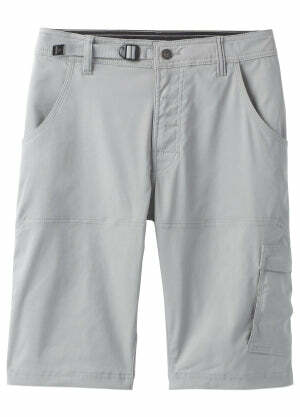 Keep pockets on your shorts to a minimum and avoid cargo shorts. You'll thank us later. Shorts come with a variety of closure systems including zips, buttons, stretch waist, and belt. Each closure system has its pros and cons. Zippers are convenient, but they can break leaving you exposed until you can get a new pair of shorts. Buttons have a much lower failure rate than zippers, but they can be difficult to undo. A stretch waist that does away with the zipper and button closure may seem like the right choice until you start losing weight and you can't keep your pants up. Lastly is the belt closure. Some shorts include a belt which can be handy if you need to cinch your shorts down as you lose weight or need an extra strap to pitch your tent in a pinch. Lightweight short with a slim fit that'll keep you cool and cut down on chafing. The Columbia Featherweight Hike Short is the newest addition to Columbia's lineup of hiking clothing. The Featherweight Hike Short is a minimal short with two side pockets and one zippered security pocket. It includes Columbia's Omni-Shield water repellent treatment and the new Omni-Shade sun deflector technology that blocks UVA and UVB rays without affecting the breathability or wicking ability of the fabric. Lightweight hiking short with high breathability for hot weather. New for 2019, the Arc'Teryx Creston Short is designed for backcountry hiking in hot weather and varied conditions. The key to the short's success is its Abron fabric, a nylon/elastane plain weave fabric that is durable as well as breathable. A bit of elastane along with stretch gussets at key points provide ample freedom of movement. With its casual design and sturdy construction, the Stretch Zion short from prAna can hold its own on the trail and in the tavern. Good looking as it is comfortable, the Stretch Zion shorts straddles both the trail life and the town life. The shorts have a casual design for everyday use but are built with materials that are rugged enough for the trail. The nylon Stretch 'Zion' fabric is both abrasion resistant and stretchy so you can scramble over boulders and jump stumps with minimal constriction. To keep you cool and dry, prAna's stretch shorts are breathable use mesh pockets for another layer of cooling and have a wicking finish to whisk away sweat. An adjustable waistband lets you dial in the perfect fit. Hot weather shorts that keep you cool on the trail. Patagonia Strider Shorts are designed for trail running, but their ultra lightweight fabric and super wicking material make them ideal for hiking in hot weather. 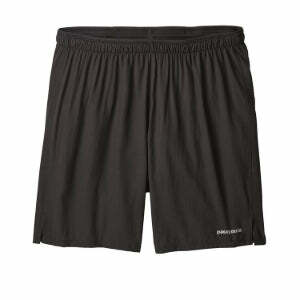 The shorts include a chafe-free polyester lining with polygiene odor control to cut down on hiker stink. Other niceties include an elastic waistband with drawcord and a small mesh rear pocket for storing small items when you are not hiking. 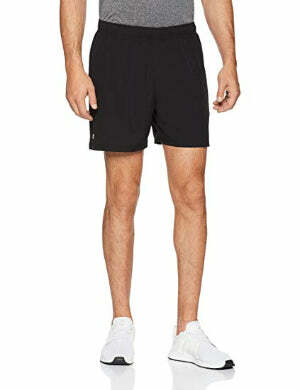 Comfortable running shorts at an affordable price. Starter's running shorts are as good as the big name brands without the big brand price tag. The shorts are made with a lightweight stretch polyester that dries quickly. The 5” inseam length is on the shorter side falling above the mid-thigh. A brief-style liner provides extra coverage and support where you need it the most. Two large side pockets, a small zippered back pocket, and an elastic drawstring waist round out the features. Short, breathable shorts that'll let you move quickly on the trail. 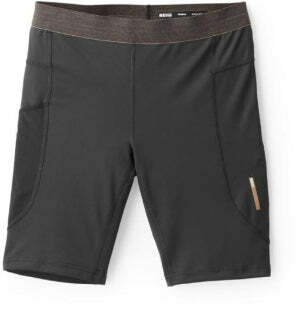 REI trail running shorts appeal to hikers looking for lightweight shorts that won't slow them down. The short's polyester fabric stretches as you move and has a DWR finish that protects from light rain. REI focused on breathability with its trail running short equipping them with strategically placed perforations. It also built-in liner that wicks away sweat and a wide waistband that fits comfortably without riding up. Tough nylon shorts for all your outdoor adventures. The Men's Ferrosi shorts from Outdoor Research stand up to the rigors of the trail thanks to their 90D nylon construction. The nylon material is woven with spandex that gives the shorts ample stretch allowing for a full range of movement and no constriction. 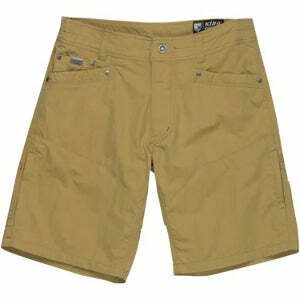 The shorts have a stylish slim fit with several low-profile pockets for stashing small items. The KUHL Silencr Kargo shorts are packed full of features that elevate it above your standard cargo short. The fabric is stitched together with an articulated design that follows the natural lines and movement of your body. It has seven pockets including two rear pockets that are positioned, so you don't sit on the pocket contents. For extra comfort, the waistband is lined with a soft microchamois.